A war is coming, a battle that will stretch from the deepest trenches under the sea to the rocky craters of the moon, in New York Times bestselling author James Rollins’s groundbreaking masterpiece of ingenuity and intrigue that spans 50,000 years in human history to mankind’s next great leap-but will it mark a new chapter in our development . . . or our extinction? A series of strange events throws the world into turmoil. As a manned Chinese rocket explodes upon launch, three American astronauts, each separated by thousands of miles, are murdered. then an archaeologist in Croatia uncovers a new cavern system that reveals elaborate primitive paintings by a tribe of Neanderthals. the artwork, painted in blood, illustrates an immense battle between the Neanderthals-joined by Homo sapiens-and frightening shadowy figures. Who is the ancient enemy depicted and what does it mean? the search for answers will take Commander Gray Pierce of Sigma Force 50,000 years back in time. As he and Sigma trace the evolution of human intelligence back to its true source, they will be plunged into a war for the future of humanity that stretches across the globe . . . and beyond. From ancient tunnels in Ecuador that span the breadth of South America to a millennia-old necropolis holding the bones of our ancestors, from the lost archives tied to the sunken continent of Atlantis to the first moon landing, Sigma embarks on its most harrowing journey ever-and faces off against its greatest threat: an ancient evil, resurrected by modern genetic science, strong enough to bring about the end of man’s dominance on this planet. Only this time, Sigma will falter-and the world we know will change forever. I am always on the lookout for books which remind me of Matthew Reilly’s – not just action, but also an historical element. I had never heard of the Sigma Force novels before reading this (it’s actually number 11) but I will definitely be searching out the others now! While the Sigma Force team appears to be the link between all the novels, the story is still firmly centred on the characters of Lena and Maria Crandall, twin sisters who are studying the origins of intelligence. As part of their studies, they have created a Neanderthal/gorilla hybrid, an incredibly intelligent specimen named Baako. Maria struggles throughout the book with the ethics of keeping such a creature in captivity. The Sigma Force team member assigned to Maria and Baako, Joe Kowalski, was one of my favourite characters in the book (after Baako) – he isn’t convinced that he is the right person for the job, yet he manages to win the trust of both his charges and keep them sane throughout their ordeal. Lena has been invited to view an archaeological find, a cache of bones discovered in a Croatian cavern system. The find is astounding, as the cavern has been formed to look like a Catholic cathedral, despite the ancient nature of the specimens. While there, the team is attacked, and the cavern destroyed. Sigma Force is deployed to find Lena and uncover the purpose behind the destruction. I absolutely adored the scientific bases behind most of the story and really liked how Rollins incorporated questions of ethics throughout. Is it right to keep intelligent creatures in captivity? Is it right to keep information from the world if they’re not ready for it? Who gets to decide that the world isn’t ready? The author’s note at the end explains what is truth and what is fiction. It is absolutely fascinating what I learn from fictional stories. Some of the books Rollins referenced sound incredibly interesting and I may have to find them too! The entire field of intelligence is totally compelling, and Rollins has made me consider the ethics of pursuing new areas of enquiry, while teaching me so much. 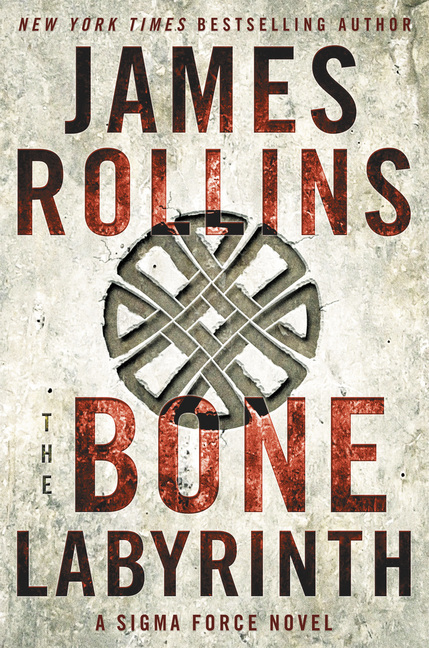 Like Matthew Reilly’s thrilling novels, The Bone Labyrinth has left me thinking not just about the characters and their fates, but also about the historical and scientific information on which the story has been based. Absolutely perfect for fans of Matthew Reilly, I am so excited to have discovered James Rollins (even if I’m a bit late to the party!). I will be searching for the rest of the series immediately! Thrilling and fast-paced, the book doesn’t leave much room to breathe! Do you like learning from fiction? Has fiction ever incited a particular interest?